You do not need to spend a lot to get quality and features. 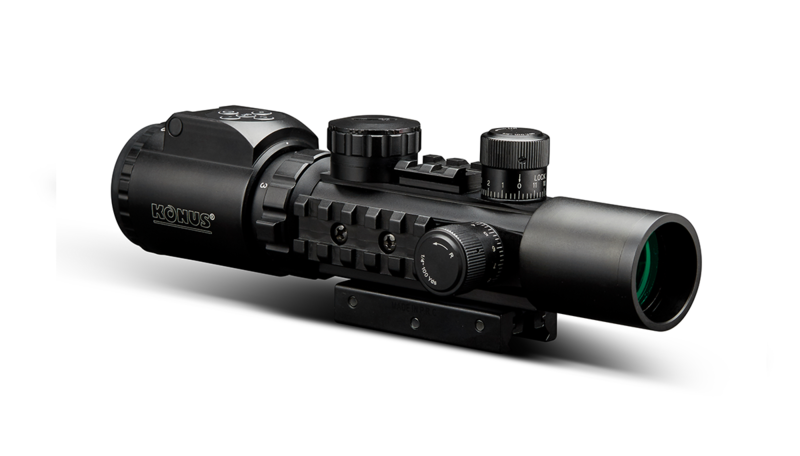 Konus Optics offers some great optics priced well below what you'd expect to pay. The Konuspro AS-34 has been constructed with quick target acquiring properties. Speed and accuracy have therefore been enhanced, whether at the range or in close quarter combat situations. A beefy outer diameter of 34mm will withstand the most extreme conditions, while an integrated tri-rail system will accept all of your accessories. Completely waterproof, this model features a dual illuminated Mil-Dot reticle and an illuminated level bubble for low light shooting. The base is reversible and will fit both the Weaver/Picatinny and .22 rails, while the field of view is especially wide for fast moving targets.